The Adult Spelling Bee officiate will be Kay Oughterson, Carnegie Public Library staff member and retired Miami Trace educator. E-N-T-H-U-S-I-A-S-T-I-C spellers and lovers of the written word, unite! If you fancy yourself a meticulous wordsmith, consider a little friendly competition this winter — join Carnegie Public Library at Two Scoops of Sugar in Washington C.H. this Friday for its first Adult Spelling Bee. Sign-up at the library before Friday, Feb. 8 at 5:45 p.m. to participate. The Adult Spelling Bee begins promptly at 6 p.m. on the stage at Two Scoops of Sugar. “Bee” sure to check out the Facebook event page for your study guide of spelling bee words. You can compete as an individual, or as a representative from your workplace or organization. It’s all fun and games, but the champion will earn bragging rights and a cool prize. Space is limited. This event is open to adults 18 and over and Fayette County residents only. Is spelling not your forte? Plan to stop by Two Scoops of Sugar on your “Valentine’s Shop Hop” route between 6-8 p.m. for a studiously good time! Two Scoops of Sugar will have its customary selection of delicious cookies, beverages and more for a warm-up or sweet treat. Information about all of the Carnegie programs can be found on the library’s website, www.cplwcho.org, or by calling the Washington Court House Library at 740-335-2540 and the Jeffersonville Library at 740-426-9292. All programs are FREE, unless otherwise noted. Check the library out on Facebook; follow it on Twitter @cplwcho. 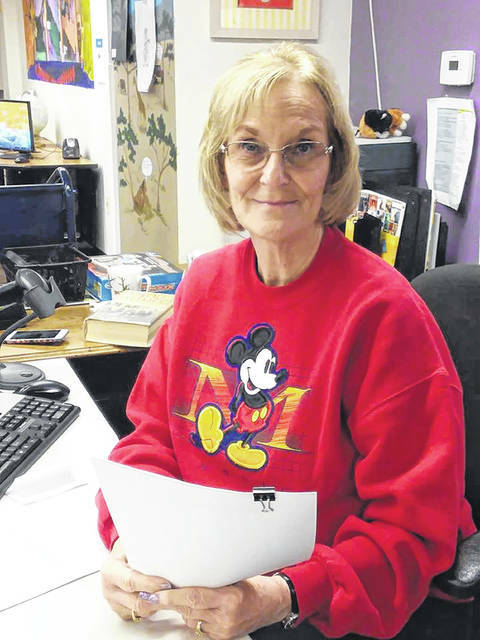 https://www.recordherald.com/wp-content/uploads/sites/27/2019/02/web1_kay-spelling-bee.jpgThe Adult Spelling Bee officiate will be Kay Oughterson, Carnegie Public Library staff member and retired Miami Trace educator.